Surly - Litespeed - Scott - State Bicycle Co.
We carry road bikes, commuter bikes, single speed/fixed gear bikes, cyclocross bikes, adventure/gravel bikes, and touring bikes. We stock carbon, aluminum, and steel models to best suit your needs. If you need something we don't have, we make special orders hassle free. 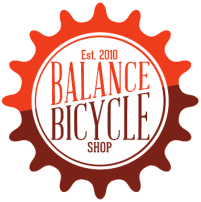 We don't stock Tri/TT bikes or mountain bikes. We believe fit and function are key to buying a new bike. We focus on your needs by first listening to what you want your bike to do. That may sound like a silly question when we ask it, but it will help identify the function you need from your bike. Then we work with you on fit. We have different tools available to identify your ideal size and we stock different sizes so we can work with you to get your fit dialed. With your new bike purchase, you will receive free minor adjustment on your seat, handlebars, and other non-moving components as long as you own the bike. You will also receive a coupon for 10% off , two free tune ups, and one free flat fix.